should not be buried but simply pushed under the soil evenly using a flat piece of wood . Basil does not have special requirements in terms of soil , but it is recommended to prefer one very fertile and humus-rich , neutral pH and above all well-drained, always to prevent the water supplied stagnation. By choosing a particularly fertile soil you can avoid fertilizing seedlings. Once the seeding , we must put the container in a shady spot at an ideal temperature of about twenty degrees centigrade. To keep constant the temperature and the humidity , it is recommended to cover the jar with a plastic sheet and provide to moisten the soil by feeding frequently water through a sprayer . 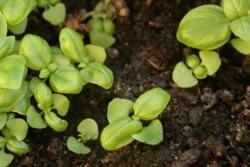 The first seedlings begin to sprout after about eight to fifteen days from sowing . Once the plants have issued at least four leaves each, they will be taken from the seed bed and planted out in the final container in groups of three or four. The plant , once it becomes an adult, after about a month after sowing , it must always be kept in a sunny place on average . Excessive exposure to sunlight , in fact , brings a bloom that promotes rapid desiccation of the plant and the loss of its aromatic properties. For this reason , as soon as the first flowers begin popping , you will need to trim all the stems with your fingers. A good deal of shade during the hottest hours of the day, on the contrary, stimulates the development of larger leaves and greater production of the aromatic properties of the plant. The ideal temperature should be instead between twenty and twenty-five degrees and never fall below ten , while the watering should always be frequent and abundant . For this reason, for planting in pots, will be chosen a terracotta container , to allow the soil to breathe. Since this is an annual plant , to maintain long its cultivation, it is recommended to carry out the sowing every two or three months during the year while repotting will be carried out in the spring, at the time of sowing. In the case of diseases arise , it will be better to buy new plants or to provide new sowing . 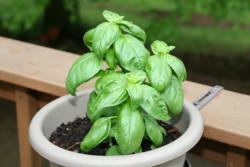 This is because the basil is used for food and the possible use of chemicals could be harmful. Finally the leaves, for their fresh use, must be collected gradually and cut with all the petiole. Their preservation can be done either in glass jars , properly covered by a bit of olive oil , or by freezing.